The TWiVidae review universal influenza vaccines that are in clinical trials, and discovery of an atypical parvovirus that causes chronic kidney disease in middle aged, immunocompromised laboratory mice. The TWiVodrome considers the intestinal tract as an alternative infection route for MERS coronavirus, and how reduced accumulation of defective viral RNAs might lead to severe influenza. 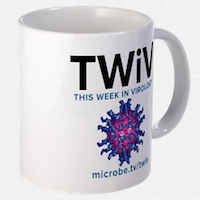 Scott Hensley joins the TWiVites to review the current influenza season and presence of the virus in exhaled breath of symptomatic cases. The Beacons of Viral Education (aka the TWiVoners) reveal a cost of being a male mouse – the Y chromosome regulates their susceptibility to influenza virus infection. The TWiV gurus describe how to use an orthogonal translation system to produce infectious but replication-incompetent influenza vaccines. From the EIDA2Z conference at Boston University, Vincent, Alan and Paul meet up with Ralph Baric, Felix Drexler, Marion Koopmans, and Stacey Schultz-Cherry to talk about discovering, understanding, protecting, and collaborating on emerging infectious diseases. From the twiVivants, follow up on FluMist and Zoster vaccines, Zika virus update, and isolation of a multicomponent animal virus from mosquitoes. The TWiV team takes on an experimental plant-based poliovirus vaccine, contradictory findings on the efficacy of Flumist, waning protection conferred by Zostavax, a new adjuvanted subunit zoster vaccine.